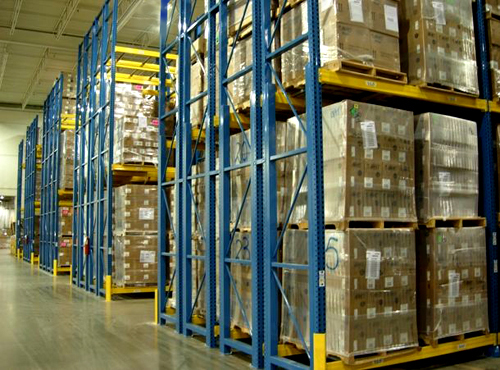 Blog Home > Material Handling > What Causes Pallet Rack Collapses? We have all seen the spectacular (sometimes humorous), but often horrifying videos of rack collapses. They’re all over YouTube. But what really happens to cause these dangerous incidents? Check pallet spacing. Don’t place pallets too close together; this causes issues with lift truck access and makes a collapse more likely, once one of them began to move or the beam unseated. Pallets should have adequate spacing between them not only for purposes of preventing a reach truck from hitting load beams, but also for fire safety compliance. (According to the National Fire Protection Association, there must be a six inch horizontal “flue space” between loads in a rack structure.) Does your rack have it? Check for damage — do it regularly and repetitively. A program of regular inspections and a culture of safety compliance may help prevent a costly and potentially dangerous accident. Make sure your warehouse personnel understand that a rack collision should always be reported. It’s their lives and health that are in danger. Store heavy loads in lower bays. If your rack wasn’t designed for a heavy load, a collapse could be inevitable. Be certain that your rack can hold your load, particularly in the upper levels. Even better, store the heaviest loads either in lower bays or on the floor. Slot your storage so that if you have mixed loads, the lightest pallets are in high bays, and the heavier ones lower. Specify the right racking system. Be certain that if you are storing high density, heavy loads like liquids, that you specify the right rack type. You may need a bolted or structural rack rather than standard teardrop. Seek professional assistance if you aren’t sure. Are the beams spaced correctly? If your rack was adjusted or rebuilt, purchased as used equipment, or utilizes a mixture of rack types/brands, it is nearly impossible to be certain it can hold the load. Since overall capacity is determined by vertical beam spacing, and in particular by the height of the first beam level, this is a critical area. Don’t allow inexperienced installers who do not understand the factors that can make a rack safe or unsafe to put together racks. Check the center of gravity for pallet loads. This goes back to load size vs. depth of the upright. If pallets at any level are not evenly stacked and the main weight is focused towards the front of the pallet, the weight can pull the racking forward. Any slight disruption or impact could set a collapse in motion. If the pallet isn’t deep enough, it can also compromise integrity. Finally, train your people for safety. Let them know that rack isn’t safe if it’s hit, if it’s loaded with too much, or loaded incorrectly. Make sure they understand the severe consequences of rack accidents.